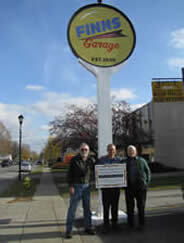 Pictured are Tim Finn, Kevin Finn and Wilfred Finn, three generations of owners of the Finn Garage and Servicenter Inc. at 45 East Main St., Webster. Finn's has been chosen as the November Site of the Month for the Webster Village Historical Preservation Commission. Wilfred Finn and George Finn started the business in 1939. It was a Texaco gas station. They also serviced cars and began a towing business in the early 1940's. When Wilfred and George retired in 1985, Tim Finn (George's son) took over the business. When Tim retired in 2006, his son Kevin took over the business. The gas pumps were removed in the late 1980's and it became a service center. When the gas station opened in 1939, five gallons of gas could be purchased for $1.00. A house and barn belonging to Earl Smith's brother's family was originally on the property.